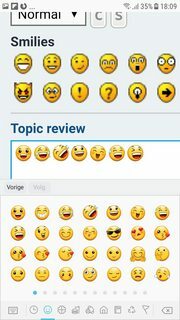 Even without knowing the answer of EmojiOne, is in the spirit of or in accordance with the policy of phpBB to have this functionality in core? EmojiOne doesn't use a standardized license; they can change it anytime (as stated) and it's proprietary, restricting it the use (as opposed to the free software GPLv2 license that phpBB has). Why all this fuzz about in core or not this and that? As i see it, you are good at coding, disable emojis and all will be good. Thank you for your patience. It looks like phpBB is in the clear since it's only using the free assets for display but not including them for redistribution. We plan to make changes to our Free Licensing Terms to reflect this type of usage. It is not open source projects that we are trying to make our emojis unavailable for, it's the redistribution of our assets. I hope this helps clear things up a bit and feel free to shoot us an email back if you have any other questions. I've sent them now an email back asking about the attribution (for the record). Reflects exactly what the guys over there told you. And yes, the attribution is the only thing IMO which needs further clarifications. Remains to "fix" the bit about the CDN stuff, I am following the evolution of this topic prior to create a PR which could include that attribution part as well, in case. Reflects exactly what the guys over there told you. Because of my question to them, they've understood their license is unclear. That's why they are going to change it. Emojis from EmojiOne with their proprietary license and attribution link in the footer - If EmojiOne is moved to an extension, the phpBB core itself would not be promoting the proprietary, redistributing limiting EmojiOne. Using another proprietary emoji-set of choice. Using an open source emoji-set of preference and where it is possible to load them from the own server (For security. That was the issue, how the emojis came on my radar. - Before short I didn't even know what "an emoji" was). I don't find "actively maintained" an important criterium. It can be that the work is considered completed. I think you're confused about what this emoji support added actually is. When you add an emoji to a post it is stored as a utf-8 mb4 character. The post_text column encoding was modified to accommodate this type of data (before this change it would actually throw an error in previous versions). However this meant that each OS would just interpret these characters on their own and add the system's style of emoji. Based on your replies it appears that you are unaware that turning off EmojiOne will not actually disable emojis from showing up. The whole point of the s9e text formatter using the EmojiOne library, or really any other system using such a library for the emojis is so they look consistent across devices and OSes. It looks like phpBB is in the clear since it's only using the free assets for display but not including them for redistribution. We plan to make changes to our Free Licensing Terms to reflect this type of usage. It is not open source projects that we are trying to make our emojis unavailable for, it's the redistribution of our assets. The mess about emoji as i understand is about cdpr up-coming rules and attribution question. How do we violate it if only thing we get is a absolute path to .png file, there should be no data collection from that cdn site? If that attribution can only be solved by adding short line of code to footer, then it's ok i guess, but would prefer a title tag instead. I had to look that up: utf8mb4 is actually MySQL's specific name what everybody else is calling utf8. Turning of the EmojiOne insert would be better as the basic option (the core). Just using the emojis of the OS/browser is a good solution. Anything else is trying to do too much. I think having an extension to disable the emoji library for the few persons that want to do that is the actual solution to the problem you seem to have with EmojiOne, not having someone spending development time adding another rarely used setting.